A sprain is damage to a ligament (usually a tear to the ligament) that occurs when the joint associated with the ligament is taken beyond its functional range of motion. Sprains can occur in any joint, but are common in the knee, hock and carpus of the dog. Note: Sprains occur in ligaments, which connect bones to bones. Strains, on the other hand, occur in tendons, which connect muscles to bones. Lameness is the hallmark of ligament sprains. Lameness, that is severe or lasting for more than a few minutes, needs to be evaluated. Non-weight bearing lameness is rare with ligament injury; non-weight bearing lameness usually means the limb has a fracture. Usually, the pet bears some weight on the limb, or has a persistent change in gait. Diagnosis of a ligament sprain requires careful examination of the pet, as well as an evaluation of the gait. In some cases, evaluation of the amount of pressure or weight born by each leg is tested with a stance analyzer to accurately determine which leg has the problem. Starting with the toes and the nails, each individual toe joint will be palpated while watching the facial expression of the pet to see if there is noticeable discomfort. The practitioner will gradually work their way up the foot, feeling each joint for fluid and swelling, or abnormal angle of use. Comparisons of the left foot to the right foot help determine subtle differences. Ligamentous sprains usually cause swelling from increased production of fluid in the joint, which can be felt. When the affected joint is manipulated, there is usually pain present. Areas of damage also have increased temperature, which can also be compared to the opposite side. Pressing down on the shoulder or hip areas can also determine weakness in stance that may help determine where the damage is. Once an area is identified, radiographs are necessary to confirm the swelling or increased joint fluid. Radiographs will likely require sedation if the pet is painful. Ligaments do not show well on radiographs, and today it is more common to follow radiographs with ultrasound evaluation of the joint and ligaments. Ultrasound works for conditions that involve differences in water density (See example images below). Ligaments that are torn have increased water content which shows well on ultrasound. Ultrasound is also the key to accurately treating the joint with stem cells or PRP. These therapies do not work if they are not placed directly into the joint or ligament affected. Severe unstable joints with torn ligaments require surgical stabilization. Joints with acute swelling can benefit initially from cold therapy (see our therapeutic modalities section). Reduce the activity level. Compression bandaging is indicated for humans, but is difficult with most pets. Anti-inflammatory medications are helpful. Support bandages or splints for 6 to 10 weeks may be necessary to protect the ligament during the healing process. Surgical stabilization of ligamentous injuries has a high failure rate. Ligaments are almost impossible to suture together for a “primary” cure. Ligaments are short, inside the joint, and difficult to gain access to without opening the joint itself. Arthroscopic surgery of the dog or cat joint is not a viable alternative because of the small size of the joints compared to humans. Stabilization of the joint, therefore, requires artificial implants to mimic the action of the ligaments. These implants can have secondary complications such as infection, and they fail at a high rate. In experimental models of ligament damage, stem cell therapy has been shown to produce better results than surgery. Stem cell therapy heals ligaments, recreates the enthesis (the anchor point of the ligament to the bone) and produces type II collagen that mimics the ligament tissue before it was damaged. Surgically repaired ligaments heal with scar tissue, not type II collagen, and are never as strong as the original ligament. Stem Cell Therapy and PRP are, therefore, the treatment of choice for ligament sprains. Research shows that the therapy must be placed into the damaged ligament to be effective. Injecting PRP and stem cells into these cases requires advanced imaging such as ultrasound. 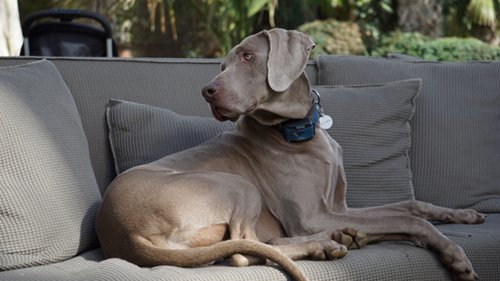 Osker is a Weimaraner dog with ligament injury called hyperextension injury. Osker is a big dog, and jumped down from a high bed onto the floor, placing all of his weight on the ligaments supporting the carpus (wrist). These ligaments failed, causing lameness and swelling. Radiographs show the swelling, but not the exact area of damage. Ultrasound, on the other hand, showed the ligament and the area of tearing. This area was injected with PRP, and Osker healed well. Unfortunately, a couple of months later he did the same thing on the other leg.